For a country that dotes on the Lionel Messis and Cristiano Ronaldos of the world, today I feel gutted, sad and disappointed – but at the same time extremely ecstatic, proud and astonished. Yes, football can be cruel, and there’s no greater proof of this than seeing India exit the 2019 Asian Cup in the most heartbreaking fashion, by conceding a penalty with two minutes to go on the clock. The team had succumbed to the nerves and the pressure lost the game in the dying minutes. India, who were two minutes away from progressing to the knockout stages, ended up at the bottom of the group and left many like me teary-eyed and distraught. Yet even as the dust settles on a heartbreaking loss my heart is filled with an emotion not associated with a loss – one of pure unadulterated joy. And why not! 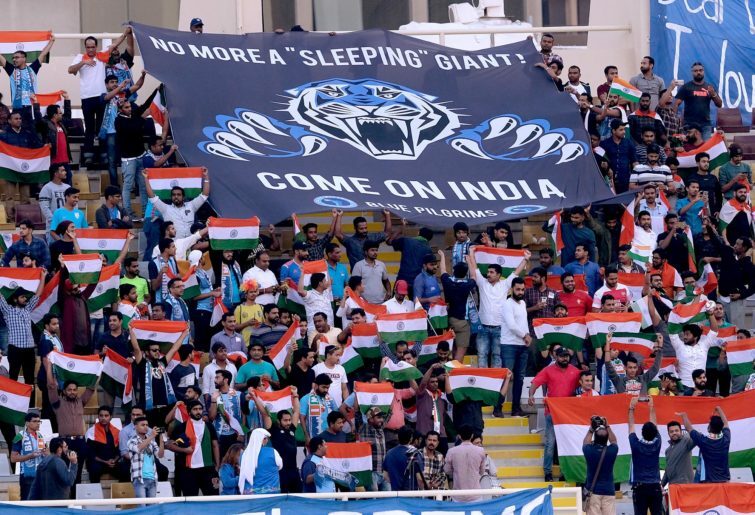 Finally the day has arrived when an Indian football team has made its countrymen sit on the edge of their seats for 90 minutes, breathing gigantic sighs of relief as our valiant defenders constantly repelled the Bahraini attack. It soon turned to cries of distress as our forwards failed to convert their chances, and then utter agony as we conceded the goal that ripped our hearts apart. India in the sporting world is generally synonymous with its cricket team. Our hockey team, resting on ancient laurels, still holds some sort of mystical nostalgia for my father’s generation. As for all the hoopla over archery, badminton, shooting and wrestling, they surface in one’s consciousness about once every four years during the Olympicsm certainly if someone wins a medal. But football? Well, we love ‘our‘ football, but ‘our‘ here means the EPL, the European Champions League, the World Cup and the Euros. Yeah, that’s our football. Competitions in which there is no Indian presence. We have pretty raucous fights about who is better between Ronaldo and Messi, Pele and Dieog Maradonna, Argentina or Brazil and, more recently, Germany, Italy or France. You get the drift. This is ‘our‘ football. Like most Indians, I knew the name of only one Indian player in the current squad, Sunil Chhetri, captain marvellous. Oh, did I say captain? Only when I looked at the squad did I see Chhetri was not the captain anymore. The ignorance! And I call myself a passionate sports fan. I felt ashamed of myself, because there I was reeling off statistics of the number of goals Miroslav Klose has scored in World Cup history, but at the same time I did not even know the name of my own country’s football captain. India does not have a rich football history. If we stretch it, we could say we had a glorious 15-year period in the 1950s and early 60s when we were regularly among the best sides in Asia, yet we never qualified for a World Cup. And as standards dwindled and cricket started gaining prominence, Indian football ceased to exist in the public’s imagination. Yes, we always hoped that somewhere some miracle would happen and we would suddenly have a team worth cheering for that would give us moments such as those I experienced last night. Nights of hope, expectation, agony, ecstasy – a whirlpool of emotions. Oh, an Indian football team worth cheering for, worth crying for – what joy to behold! Precious moments we as a nation have been waiting for in the most beautiful game of them all. Finally the time has arrived – for me at any rate. Our system seems to be finally working. A process that has been put in place over the last three years has seen our team rise up the rankings, slowly, doggedly. Often we’ve slipped and fallen and been left crying like a toddler, but we’ve gotten up and crawled a few more steps. As the 2019 Asian Cup began we were in a group comprising Thailand, Bahrain and hosts UAE, teams whom we have traditionally struggled against. Most people expected us to lose all three matches quite convincingly – hell, most people in India did not even know that we were participating in this prestigious international tournament, also called the World Cup of Asia, for only the fourth time in our history. Yet a couple of weeks later, even as we stand eliminated at the brink of further progress, a nation’s heart swells with pride and joy as we realise our country has a football team we can now passionately support and have expectations for. Yes, a World Cup qualification might still be a distant dream – some might even call it a farfetched pipedream – but now they have given us a reason to believe, a reason to stay hopeful, a reason to stay up at night and support our country’s football team. There were 25 minutes to go for the India versus Bahrain match to end. The score was locked at 0-0. And India got a free kick. Sunil Chettri came to the spot to take the kick. The whole stadium was chanting for India, A goal here would have seem India progress. I sit upright waiting with bated breath. Chhetri misses the goal. We sigh in distress. We go on to lose. But the commentator sums it up perfectly. We have fallen in love once more.